Since expanding to Burkina Faso in 2014, buildOn has constructed more than 75 schools in the West African country—increasing access to education for vulnerable rural populations. 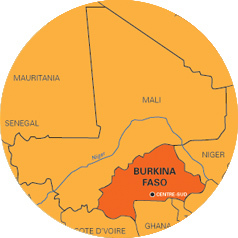 The UN Human Development Index ranks Burkina Faso as the seventh least developed country in the world, taking into consideration life-expectancy, education, and standard of living. Lack of access to education in Burkina Faso has resulted in a national literacy rate of only 35 percent. No country has ever achieved continuous and rapid economic growth without first having at least 40 percent of its adults able to read and write. More than 12,000 students attend buildOn schools in Burkina Faso. buildOn works with local communities in Burkina Faso to ensure girls are given equal access to education. Local community members across Burkina Faso have dedicated themselves to more than 157,000 volunteer work days to build schools. Students from Yaonghin village read inside their new buildOn classroom. Too many students in Burkina Faso go to school in hot, temporary structures that don’t properly protect them from the elements. Use your creativity to raise awareness of the education crisis in Burkina Faso and fundraise to help end it. $35,000 will fund an entire school. Help bring quality education to students living in poverty in Burkina Faso. Just $22 provides access to education for a child in Burkina Faso.